Read the prologue to Jean Tennant's unpublished novel, Karaoke Nights at the Twilight Lounge, here. Read chapter 1 of Jean Tennant's unpublished novel, Karaoke Nights at the Twilight Lounge, here. Read the rewritten chapter 1 that brings the action forward here. Read chapter 2 of Jean Tennant's unpublished novel, Karaoke Nights at the Twilight Lounge, here. Read Jean's agent query letter here. 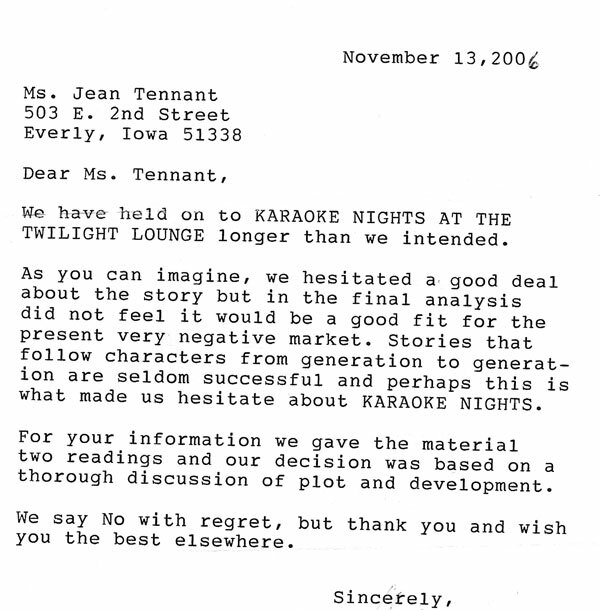 Read Jean's interesting rejection letter here. Read Mark's original story here. Read "Scene with Mack" here. Read Mick Halpin's critique of "Scene with Mack" here. Read the scene in which Mark introduces his protagonist's girlfriend here. Read Mick Halpin's critique of the scene in which Mark introduces his protagonist's girlfriend here. Read parts of chapters 9 and 10 interleaved with another Mick Halpin critique here.